The history goes back to before the title of Tai Situpa was bestowed upon this line of tulkus, to the time of the Indian mahasiddhas, or "great accomplishers," who gained renown for their sanctity, often accompanied by miracles. According to tradition, the Tai Situpa is an emanation of the bodhisattva Maitreya, who will become the next Buddha, and who has taken form as numerous Indian and Tibetan yogins since the time of the historical Buddha. The mahasiddha mentioned in the biographies as such an emanation is Dombipa, king of Magadha, disciple of Virupa. He was a saintly man who practised tantra secretly for twelve years before he abdicated in favour of a contemplative life in the wilderness. 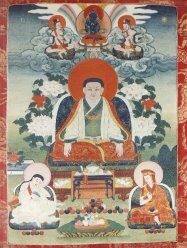 Another incarnation was Denma Tsemang, one of the twenty-five main disciples of Padmasambhava, who was noted for his phenomenal memory. One of the first Tibetan incarnations of significance was Marpa (1012-97) who, as previously mentioned, studied in India, returning with the lineage transmission from Naropa and others, as well as with texts for translation. He made three trips to India in all, and his biography is of great interest to modern practitioners of Buddhism. He was a family man and a farmer, cantankerous by all accounts, who experienced such vicissitudes of life as the untimely death of a beloved son, but who managed to include scholasticism and fruitful practice into his layman's routine, with the assistance of his exceptional wife, Dagmema. The incarnation of Drogon Rechen (II48 - I2I8) established the link between the line which became the Tai Situpas and the Karmapas, a link which exists to this day. Drogon Rechen was one of the principal students of the first Karmapa, Dusum Khyenpa, and since that time these two high incarnate lamas have maintained a continuous guru-disciple interrelationship, which has been instrumental in the continuity of teachings and practices of the Karma Kagyu. It has become a custom for the Karmapa to recognize the Tai Situpa and become his main teacher, and for the Tai Situpa to recognize the Karmapa and transmit the teachings back to him. Two other incarnations as yogins of considerable attainment, Yeshe Nyingpo and Ringowa, followed the incarnation as Marpa. Yeshe Nyingpo was a disciple of the extraordinary second Karmapa, Karma Pakshi. Another incarnation was a Chinese emperor with unusual spiritual power whose name was Tai Tsu, who was the disciple of the fifth Karmapa, Dezhin Shekpa. He was clairvoyant and was able to perceive an ornament on the head of his teacher that could not be seen with ordinary sight, so he bad a crown fashioned that resembled what he perceived. He presented the crown to the Karmapa to wear so that more people could become aware of it and benefit from seeing an outer representation of the inner crown symbolizing advanced realization. This offering was the beginning of the traditional Black Crown Ceremony, which the Karmapas are noted for, and which they have performed up until present times. Chokyi Gyaltsen (1377I448) was the first incarnation to bear the title Tai Situ, conferred upon him in I407 by the Chinese emperor Yung Lo of the Ming Dynasty. The complete title as it was given in Chinese is quite lengthy and is often shortened to Kuang Ting Tai Situ, which conveys the gist of it and is translated "far reaching, unshakable, great master, holder of the command." Chokyi Gyaltsen was a close disciple of the fifth Karmapa and was appointed by him to the position of head instructor of Karma Gon, the Karmapas chief monastery at the time, located in Eastern Tibet.